As I mentioned in my last post, finding the right self directed IRA can be a little work. The largest determining factor will be your goals and your amount of time. For me, I set up a complicated structure that better suited my needs and I paid a little more to have it setup. The structure, simply stated is that I transferred a portion of my existing IRA to Provident (who is the custodian that Guidant Financial set me up with). 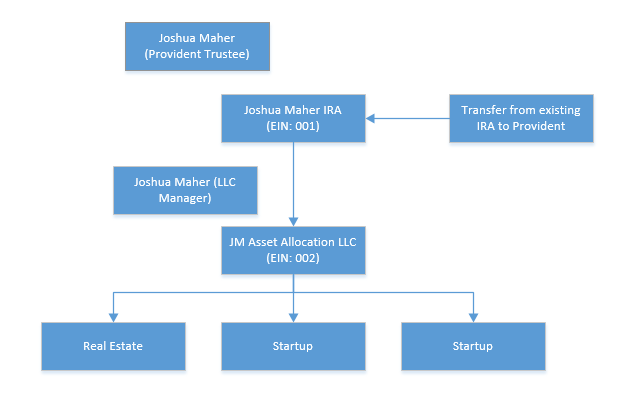 Once there, Provident put the funds into a Trust (which has an EIN and that Trust then bought 100 ownership of a new LLC that I set up (JM Asset Allocation LLC). This new LLC has a single Member (e.g. shareholder) – that single member is my Trust (Joshua Maher IRA). Once the ownership has been purchased, the LLC can invest in whatever it wants to and all returns are put back into the LLC. These returns can be paid as distributions back to the Trust if I want or they can be left in the LLC and invested in public or private markets. Instruct the custodian to invest all of the funds that are in my Trust in the new LLC that I am the manager (not a managing member – just a manager) of. The function is fairly straight forward. There are some tax implications for this sort of arrangement and as readers of my ESPP posts know – I have no problems digging in there either. From a tax perspective there are a lot of rules for Unrelated Business Income Tax (UBIT) and Unrelated Debt-Financed Income (UDFI). Not so many rules on taxes and reporting if you aren’t in one of these categories (so long as you are not participating in the prohibited transactions mentioned in Selecting a Self Directed IRA). The main difference between UBIT/UDFI transactions and PROHIBITED transactions are that the former just require you to report and pay taxes for those small parts of your transactions while the latter puts your entire IRA at risk and you will likely have to pay taxes on all your gains. If you do generate these taxes the best way to account for them is to have your LLC file a tax return (other than for these taxes it is a pass through entity), account for this income and pay the appropriate tax. Yes, when you withdraw the funds you will still be taxed as personal income even for the income on which you pay these taxes. Let’s say that you setup one of these SDIRAs with a rollover IRA from a previous employer. You set up the IRA/LLC structure to engage in a strategy known as “rehab flips.” The LLC’s activities are conducted in such a fashion that the rehab flips constitute a “trade or business that is regularly carried on” for tax purposes (thus subjecting the income to UBTI). In tax year 2013, the LLC had combined gain from the sale of rehab flip properties of $100,000 (gain = sales price – adjusted basis). The LLC had deductions and expenses attributable to the rehab flips of $30,000. As a pass-through tax entity, the LLC’s tax items are passed through to the IRA. If you want more detail on the UBIT/UDFI transactions – I have notes with a few other examples worked out… as before (comments/emails = notes). That is almost all… The last IMPORTANT thing to remember is that your IRA custodian must report annually to the IRS what your IRA is worth (including any distributions, contributions, rollovers). You will either need to do this yourself (won’t hold much weight with IRS) or you can have this done by an external party (will hold more weight). If you don’t do this – you could also get into trouble with your transaction. That is the simple version – two blog posts and you’ll be up and running and able to write checks to invest in Real Estate, Startups, etc. Now of course… where to find the right deals or learn to be an investor in those sorts of things? There are loads of resources over at TechCafe (on the top nav menu of my blog). The Seattle Angel Conference is also kicking off in September for the Fall 2013 class – they run an excellent training program for new investors. I wouldn’t say that guidant financial is one of the more cheaper custodians. If you are looking for a cheaper option there are plenty of great custodians out there that have been doing this same thing for quite some time. I’d look at the other options out there before going with one specific. http://www.accuplan.net is someone that I’d recommend but again there might be others that work better for you but I’d check them out.